Once I was an avid letter writer. Then email took over. I miss the paper, the ink and the smell of handled material touched by the sender and treasured by the receiver. It is the nostalgic and romantic nature of letter writing which pervaded my desire to hold on to them, move house with them and now to create an archive of them. Using the Artsadmin bursary I was able to take the time and space need to document and archive the 146 different people who have written to me over the years. Having moved 14 times in my life I always make sure the letters come with me. 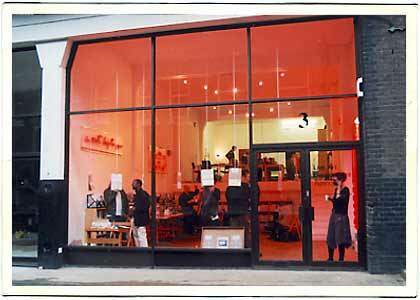 In May 2002 I was resident at the Live Art Development Agency, London, for one week. Each day I selected thematically different letters to display in the window and continued to complete the catalogue cards which explain my relationship to the recipent, personal details and whether I still have contact with them. Whilst making the archive, which will always be an on-going project, I also began to consider correspodencies which have ended either through death, or circumstances and friendships changing. I wanted to honour these 'gaps' she I started to make 'letter objects'. These are handwritten and typed letters which then go through a process of change relevant to that particular correspondence changing; they are sewn, burnt, buried and baked. Some of these 'Letter Objects' have been published in May 2004 in Performance Research Journal 'On Correspondence'.